Offering a concise, illustrated summary of biochemistry and its relevance to clinical medicine, Medical Biochemistry at a Glance is intended for students of medicine and the biomedical sciences such as nutrition, biochemistry, sports science, medical laboratory sciences, physiotherapy, pharmacy, physiology, pharmacology, genetics and veterinary science. It also provides a succinct review and reference for medical practitioners and biomedical scientists who need to quickly refresh their knowledge of medical biochemistry. The book is designed as a revision guide for students preparing for examinations and contains topics that have been identified as 'high-yield' facts for the United States Medical Licensing Examination (USMLE), Step 1. 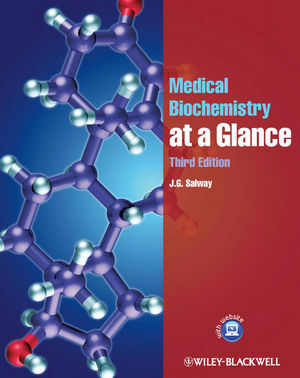 J. G. Salway is the author of Medical Biochemistry at a Glance, 3rd Edition, published by Wiley. I have taught biochemistry to medical students and to undergraduates and graduate students, at both Temple University School of Medicine and at Case Western Reserve University, since 1968, so that I have had a great deal of experience in the field and have a feel for what works well for medical students. Medical Biochemistry at a Glance would be an excellent book for USMLE Step 1. In my experience, medical students (and pre-medical students) would greatly benefit from reading it in preparation for the exam. This compares very well with Lippincott’s Biochemistry - this has the right price and approach to compete with Lippincott for a less expensive and more accessible alternative to the larger text books that are out there. Companion website features self-assessment questions and answers. "Lesch-Nyhan syndrome is a rare, X-linked disorder of hypoxanthine-guanine phosphoribosyltransferase (HGPRT) in the purine salvage pathway. (Not adenine phophoribosyltransferase).